Four buses have departed Melbourne bound for Port Moresby. They are being donated by Ventura as part of the UN Women’s project to make Port Moresby a safer city for women and children. In a 2014 study by UN Women, more than 90 per cent of women said they have been physically or sexually assaulted, threatened or robbed on public buses while travelling around Port Moresby. The Meri Seif Bus service is one of the initiatives introduced in response to these findings. Funded by UN Women and operated by the Ginigoada Foundation, Port Moresby’s Meri Seif Buses are free and for women and children only. Since its launch in 2015, more than 400 women and children have been using the service daily. Ginigoada Foundation manager pastor Mike Field says the demand for the service is growing and, thanks to the donation of four Ventura buses, they will be able to help even more women and girls travel in a safe and dignified manner. "The demand for the Meri Seif bus program is bigger than ever. Women and children queue up in hopes of getting on board. Ventura’s generous donation of four buses will address the immediate need of women and children living in Port Moresby who want and need to travel in safety," he says. Ventura’s managing director Andrew Cornwall says the company is proud to contribute to the project. "There is a startlingly high rate of violence in Port Moresby keeping women home from work, and children home from school. Everyone should have the right to feel safe," he says. 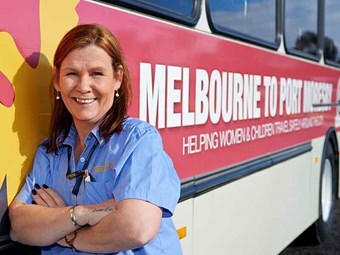 A team of Ventura’s drivers, led by Ventura’s female ambassador, Karen Fawns, drove the four donated buses from Melbourne to Newcastle, which were then shipped to Papua New Guinea. The buses will be branded in order to be recognised as a safe Meri Seif bus. They will replace the second-hand buses used in the program, one of which is completely out of service and unable to be repaired. UN Women Safe Cities Programme specialist Lizzette Soria says the Meri Seif Buses program is an integral solution to getting women delivered safely to work and children to school. "We are extremely grateful to Ventura for supporting this project. It is a huge comfort for women to know that every morning and evening, that there is a space on the Meri Seif bus for them, a safe space where they don’t need to give a second thought to being harassed, assaulted, or worse."